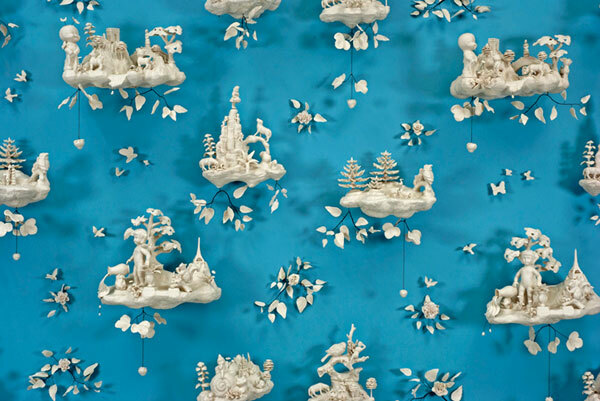 Ceramic artist Beth Katlemans’s latest installation Folly is set against a turquoise backdrop with 50 porcelain castings that put a Dennis the Menace twist on 18th century vignettes. 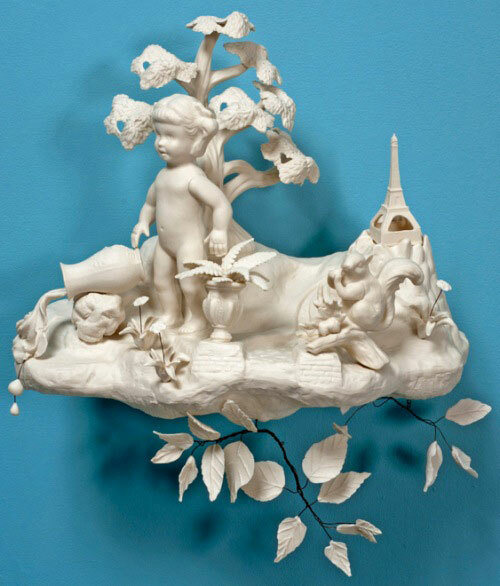 Inspired by old English wall coverings, these delicate, adorable little scenes take on a new sinister view up close, as these white castings of popular toys are much more morbid and dark than any innocent Snow Globe scene. 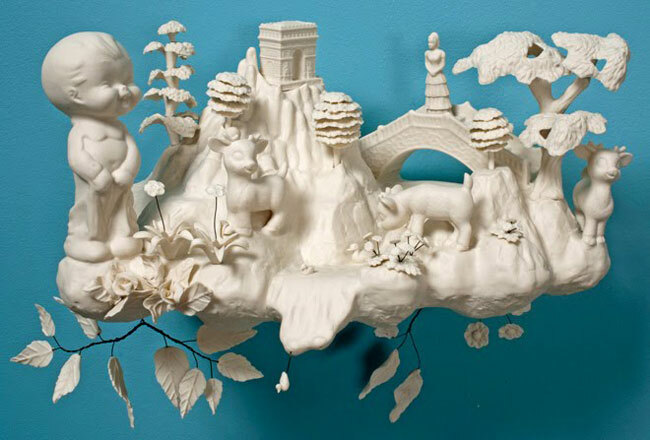 Each scene is beautifully decorated with fruits, flowers, and greenery, but Folly‘s seemingly three dimensional Fantasia world appears more Plaster Caster than Disney. 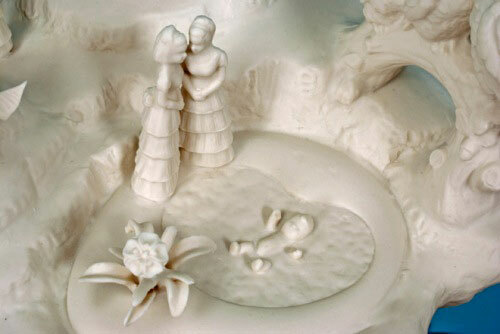 Two bridesmaids hold hands on a quiet spring day, as a baby drowns in a pond. An elf sits on a giant Alice In Wonderland snail with the Sacre-Coeur Basilica in the background. A toothless boy frolics with a reindeer as a duckling tumbles over a waterfall. 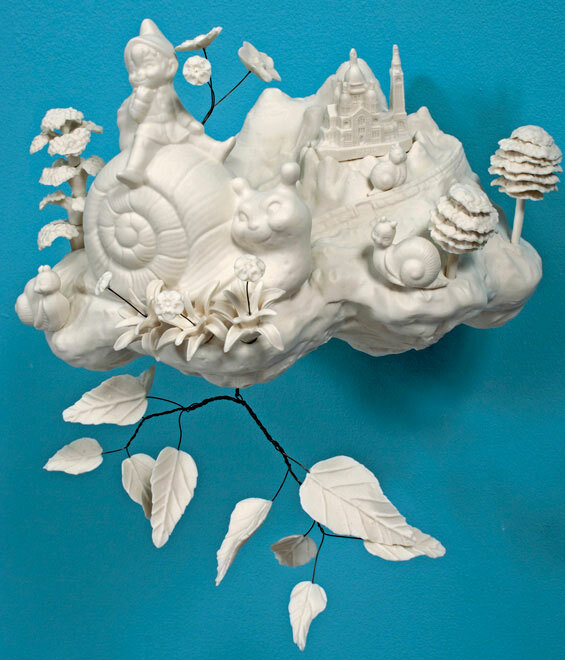 Weird and beautiful, Folly opens TODAY (January 20th) at Greenwich House in New York City.